Offers 16 selectable UHF frequencies, 50mW of audio power and included EB4 ear buds with Band Pack systems available. With its 16 selectable UHF frequencies, 50mW of audio power and included EB4 ear buds, Galaxy Audio’s new AS-950 offers stereo monitoring even in a crowded RF environment. Use a single transmitter and receiver system to give each person their own monitor mix at a live event, in a recording studio or a classroom. Or choose the optional AS-950-4 Band Pack system with four receivers and one transmitter to allow four persons to share a monitor mix. 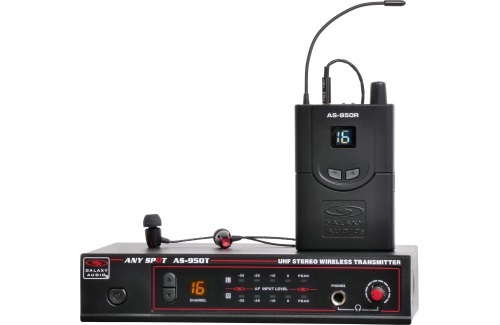 The AS-950T transmitter includes a L/R level display, channel up/down select with LCD display, stereo XLR/1/4-inch inputs, and headphone output with volume control. The AS-950R receiver offers a 50mW stereo output with RF and stereo indicators. The EB4 ear buds feature titanium drivers, extended bass response and aluminum alloy construction. A single/dual rack mount kit is included. With its frequency-agile performance and affordable price, the AS-950 brings personal monitoring to professional musicians, live theaters, houses of worship and schools. Audition the AS-950 in the 2nd quarter of 2019 at a Galaxy dealer near you. Visit Galaxy for a preview of the new AS-950 at NAMM booth 16122.